Place your orders, open your bags, reap your rewards. If you are interested in learning more about the salvageable bag strategy presented in yesterday's post then I have got some interesting numbers for you. If you have no idea what I'm talking about please refer to this video in yesterday's post and read on. I'm Josh from the GW2 ShoddyCast Channel and this will be my first of many posts here on GW2Riches. Enjoy! Observations: Between these two tests of the Small Stolen Bags only ~15 minutes passed. Someone upped the buy order by 2 copper which obviously had an effect on my profit margin. Unless it is part of some crazy strategy you cooked up,don't over-cut peoples' buy orders. It only hurts the market you are dealing in. Observations: After the Medium Ritual Bag's passed the 100 bag test above I was able to milk it for all it was worth. A good portion of my profit made that weekend came from this particular bag type. That was until someone upped the buy order price yet again a few hours later to 50 copper a bag! I don't know what that person was thinking, but I'm sure he found himself falling short when it came to profit. 50 copper a bag might have worked some other day, but that day the market was saying "no". 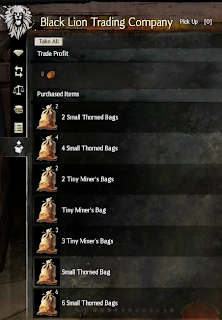 Profiting from the bag strategy is just as much about the price you get the bags at as it is about how much you get for the crafting materials inside of them. In other words no one should read this post and think "I'll go buy 500 Medium Ritual Bags at 38 copper a piece". The price of crafting materials found in a Medium Ritual Bag may have dropped considerably since last weekend. You must test bags yourself on any given day, and make sure your gains are 20% or more to help protect you from any unforeseen variables; like luck for instance, which we will see at work in the next test. Observations: "You never count your money when you're sittin' at the table. There'll be time enough for countin' when the dealin's done." Kenny was right. At the end of the 25 bag test for these Small Miner's Bags I was smiling ear to ear thinking I had found the bag that will make me rich overnight. Lucky for me I'm not that dense, so I ran a 100 bag test on the same bags.15.8% return!?! What gives? Luck, that's what. Imagine what would have happened if I had went "all in" prematurely and the return came back negative? That's why you'll want to make sure to run at least a 100 bag test before staking your fortune on a bag type. I hope you find my trials informative! Now get out there and tinker with this developing strategy and don't forget to post your findings in the comments below so we can all benefit! Speaking of benefit, if you liked this week's episode tune in every Thursday for more episodes of ShoddyCast's Gold Guru posted right here on GW2Riches. And please, show your support and Subscribe! These are the bags I tested. If you want to make this strategy work for you, you must put it to work yourself with other bag types. There are tons of bag types out there. The bags I used last weekend won't be the same I use the next. Thanks for reading! Hey glad to hear you have the patience to put up with us ;) Thanks for watching! Do we sell the bags or the items in the bags? You sell the items in the bags. And just a note on this particular way of making money - this is volatile enough that it's safe. Reason being is because whatever you open and get from a bag is (in itself) a gamble. You can hit the big time and get nothing but valuable loot from every bag you get (big ticket crafting items), or you can completely loose your investment by getting nothing but junk. (Like hordes of sticks of butter, chocolate, or straight copper). If you consistently buy bags for low prices, you'll make a decent amount of coin. But the profit is extremely low, and requires you to babysit the market. The less busy the servers are, the higher your profit. Weekends pretty much make this strategy obsolete (Lots of people playing, lots of competition). Weekdays - it's more viable. You need to have a lot of starting capital (gold) and patience for this strategy to pay off. It works though, just keep expectations in check. Great content so far. Keep it up! I had about 10 gold floating funds, and an evening to screw around with stats with a large number of bags. I'll post the bags that I was able to have at least a sample of 100 bags, some of them I have sampled many more than this. I haven't been working the listing and sale charges into my calculations, I figure the copper that you retrieve in the bags probably covers this anyway. Some of these profits were made because my samples were purchased at an unusually low price (for example Light Bag of Booty, Light Supply Bag, and Light Treat Bags). I have another 20 bag types or so that have too few in the sample group to make any real stats on so far. I will update when I have it. I made the comment right before yours on viability and volatility, and I have to say you are an incredibly patient or lucky man to score bags for those prices! Keep up the good work. Hi there, I was very fond when I first read about your strategy so I wanted to do it on large scale. I first ran some test on different bags, and I thought I found the 'good' one, Heavy Moldy bag. So I ran a 50 and 250 test at first, everything seemed right. I bought 1500 bags for 1s/each. On the end I made a 2g loss on the batch :P. It seemed that diminishing returns also kicks in after a certain amount of bags you open, anyone got a thought on this ? Generaly speaking I have found that the large moldy bags return the best profit rate, they are quite steady in price as is the tier 5 mats in it. When buying Heavy bags you get teh chance for tier 6 items wich go even higer in price but you risk getting a large loss due to not always reciving the profitable mats. I have yet to find one but the best bags would be those that does not include any leather or fabric at tier 5. That is just my observation though.